"The newsreader on Sky TV pronounced it ˈlæm.pluː, which I think is probably right." And not what LPD3 sez. I seem to notice I'm not the only person who sez /`lӕm.pəʊst/ for lamp-post and I think more careful speakers say /`lӕmp.əʊst/. All tough on pronunciation lexicographers. Returning to those twistles, I believe that Tintwistle is usually pronounced /ˈtɪnsəl/, as if it were a Christmas decoration. I'm actually quite surprised that Entwistle doesn't become /ˈɛnsəl/. As for the ē→wy phenomenon, there seems to be some interesting etymology-vs-phonetic-environment clashes going on between the two "wy" diphthongs. Pronouncing "cadwyn" (catēna) with the "ŵy" diphthong sounds odd in speech (I've actually tried that one out on a first-language speaker and had them correct me), but is correct etymologically and in poetry (the Odliadur lists it as rhyming with "dwyn", "llwyn", and "ŵyn"). I suspect I'd get the same results with "gwenwyn", but that one's harder to work into a sensible sentence. And my suspicions are that this goes all the way back to a load of Welsh words losing their final stress in the Middle Ages. John, I too immediately checked LPD3. Where else can one reliably expect to be able to check the syllabification? I did so because I felt sure I had not been hearing ˈlæm.pluː over all the years Suzy Lamplugh had been in the news. And as I expected, the entry was evidence that you had not been hearing it either, or you would not have given only 'læmp.luː. You may have seen that some of us have been exchanging commiserations about the way our instincts are compromised by thoughts of etymology, morpheme boundaries etc. Was it before or after you became aware of the Welsh etymology that you said "The newsreader on Sky TV pronounced it ˈlæm.pluː, which I think is probably right"? The revived Cornish (in Kernewek Kemmyn spelling) for "parish" is pluw. The recommended pron. is [plyw], which I guess means something like [plyʊ]. ɪt occurs (possibly) in the place-name Pleming, which may derive from pluw men = "parish (boundary) stone"
Are the predictions borne out for Lamplugh, I wonder? I haven't been listening carefully enough. This is off topic, but I'm curious as to whether Welsh lost the /b/ in Cumbrian, or if Latin inserted it? Looking back at your blog for 2 July 2008, to which you link in today's entry, I sympathize with your being stricken by the fact that two of the presenters on BBC television pronounced Entwistle ˈenʔwɪsl̩, which you pronounce ˈentwɪsl̩, although you say slantwise as ˈslɑːnʔwaɪz. Do you have no linking there at all? I usually say ˈslɑːnʔt.waɪz, or ˈslɑːnʔtʼ.waɪz with very weak ejective aspiration. But I pronounce Entwistle (and Entwisle) ˈenʔ.twɪsl̩. It's definitely not your ˈentwɪsl̩. You say there "It’s all to do with syllabification. The medial consonant sequence ntw is one of the few such sequences that allow two phonotactically well-formed possible places for the syllable boundary, nt.w or n.tw." I agree with that, but I think this is typical of these sequences in also having a third phonotactically well-formed possible place for the syllable boundary: nt.tw. As in many contexts a Janus segment like this is the only way of explaining how a lot of people have the three-way opposition that I have: for my ˈenʔ.twɪsl̩ (nt.tw), I could copy your ˈen.twɪsl̩ (parallel to my ˈen.trəpɪ) now that I know you recommend it, and I could copy the BBC presenters' ˈenʔ.wɪsl̩ (parallel to my ˈtent.rəʊp), if they came up with some spurious etymological/morphological identity for 'wistle'. A similar example is Gatwick. A surprising number of people seem to feel they have to pronounce that ˈɡætwɪk. What is the syllabification of that? They sound as if they're saying twick, and they must be, because hardly anyone fully links t in 'that one' etc these days, but ɡæ is not well formed. I grant that some of them are saying ˈɡætʰ.wɪk etc., and of course you often get ˈɡæt̚.wɪk, ˈɡæʔt.wick, ˈɡæʔ.wɪk etc, and I treat it like 'slantwise': ˈɡæʔt.wɪk, or ˈɡæʔtʼ.wɪk, but I think not usually ˈɡæʔ.wɪk. I would argue that syllabification is a phonological thing, and that phonologically if it is really ever ˈɡætwɪk, the t must have dual function as the coda of the first syllable and the onset of the second. Your recent example 'tattoo' is a much clearer case, of course. The first syllable must be tæt, as tæ is not well formed, and as you say 'tattoos' doesn't rhyme with 'that ooze', so the second syllable must be tuː. QED. I would agree with that too, if I thought anyone could be expected to know the morpheme boundary. Even if the morpheme boundary were etymologically ˈent#twɪs.l, after OE ened, it's hardly likely that would influence people's synchronic pronunciations. I certainly wouldn't claim that it influenced mine: it would have to have influenced it retrospectively, as David Crosbie yesterday quipped his new-found awareness of the Dutch morphology of Bowery would have had to influence his pronunciation of that! BTW I had never heard of Tintwistle. I would spelling-pronounce it Tin#twistle, and I don't think any revelation that it was historically Tint twistle would stop me and make me start treating it the same way as I treat Ent#twistle. Not that I think any pronunciation I have heard enables us to justify a Janus segment in Lamplugh. As you say, ˈlæmp.pluː would predict both pre-fortis clipping and glottal reinforcement (in the relevant accents) in the first syllable and devoicing and frication of the /l/ in the second. Obviously you get some devoicing of the /l/, but given pre-fortis clipping and other evidence of the p belonging to the first syllable, I don't think I've heard enough frication to encourage me to think that the pl functions as an initial cluster in the second. My first response to today's blog entry makes it pretty obvious how astonished I was to learn that pluː as the second syllable was even a possibility, Welsh etymology or no. The interesting thing for me is that, while 'petrol' has to be ˈpet.trəl' in RP (as opposed to ˈpet̚.rəl, ˈpeʔrəl etc. ), 'sickly' may I think be ˈsɪk.klɪ when it's an adjective, but ˈsik.lɪ when it's an adverb. I think I distinguish them. I really do. Obviously we agree that the medial stop is not pronounced double-length in any of these words. - in which we could have a 4-way difference if we have glottalling only in 3 and gemination only in 4. Wonderful! Thanks for the 'paired lamprey' twist. But, always supposing we have -ɪ in lamprey, we could have glottaling in both 1 and 3 (or no glottaling in either) and still have a functional opposition between the two without resorting to talk of juncture phenomena, as it doesn't depend on glottaling but on whether the p functions as both coda and onset, with consequent devoicing and frication of the r, as in 'lamprey', or only as coda, with little if any effect on the r, as in 'lamp'. I thought Lamplugh was like 3 (and so apparently did you in LPD), but it now looks as if it ought to be like 2, and no doubt all along some people have been saying it like 1, parallel to my 'Entwistle' (v.sup.). 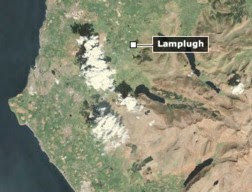 If they do, 'Lamplugh' can be seen as one phonotagm (cf. 'tattoo', 'cashew' etc), like lamprey, or two, distributed as in 2 or 3. My last name is Lamplugh (which is unfortunate in this circumstance with the gunman) but you are correct, we pronounce our last name ˈlæmplu. According to Ekwall the placename is from Cumbric, not Welsh. Cumbric was a Brythonic language anmd thus related to Welsh, and presumably similar to the Welsh of its time. Unlike Welsh though, Cumbric is thoroughly extinct.